How do I disable Chrome's two-finger back/forward navigation? In dev builds of Chrome, they've implemented, refined, and released two-finger swipes left/right in order to browse back/forward in the browser history. Unfortunately, you can accidentally trigger it while you're in the middle of a long down/up scroll, which needless to say occurs often. I generally like the gesture, and things like Preview, Safari, and other application have implemented it much better, where you cannot blindly navigate back/forward so long as you have begun to scroll up/down. How do I selectively disable two-finger back/forward navigation in Chrome? I know its over a year later, but I had the same question, and then figured out the answer myself. Now you can have it enabled system wide, and just disabled for chrome. By the way, this works for any app, just replace com.google.Chrome with the bundle identifier of the target app. If your interested in how it works, the AppleEnableSwipeNavigateWithScrolls is the global setting, that can be overwritten for any specified app. I went into the System Prefs and changed the Page change gesture from two fingers to three (OSX Lion). The three finger swipe seems to be more responsive at any rate and I'm usually only using two fingers for everything else. There are two different properties, one is for the Trackpad: AppleEnableSwipeNavigateWithScrolls, the other is for the Mouse/Magic Mouse: AppleEnableMouseSwipeNavigateWithScrolls. It looks like Google Chrome uses Apples default gestures, so by disabling Apples gestures you disable Chromes. However, you probably still love some gestures like I do. For that get BetterTouchTools (BTW, its Free). You can disable chromes gestures by going to System Preference > Mouse OR Trackpad > More Gestures > and uncheck Swipe between pages. I still love gestures so I downloaded BetterTouchTools which allows me to make the gestures I want. I disabled all apples gestures then created my own. You can get very custom with gestures this way. Or if you prefer, leave some of apples gestures on and use BetterTouchTools for the more custom ones. The only way I'm currently of is two disable two-finger page swiping system-wide, from the Trackpad section of System Preferences. I wait patiently for Chrome to either fix its implementation, or at least provide an app preference for disabling the feature. I also tried the terminal command on Yosemite, it didn't work for me. And then I tried uncheck "Swipe between pages" in mouse settings, and it worked. Not the answer you're looking for? Browse other questions tagged google-chrome multi-touch . What application can record a cursor location and multi-touch input heatmap? 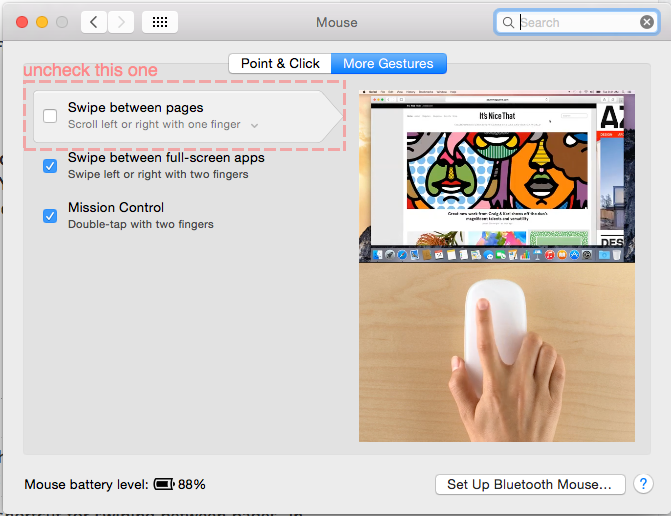 Do three finger navigation gestures work in System Preferences? How do you turn Three Finger Drag on? How to get the three finger 'scroll to top' back in mountain lion?